Settings: Printed on a Replicator 2 with .2mm custom slicing profile. stick(T(p,q)) = 2q, if 2<= p < q <= 2p. (1/2)(5+sqrt(25+8(c(k)-2))) <= stick(K) <= 2 c(K). 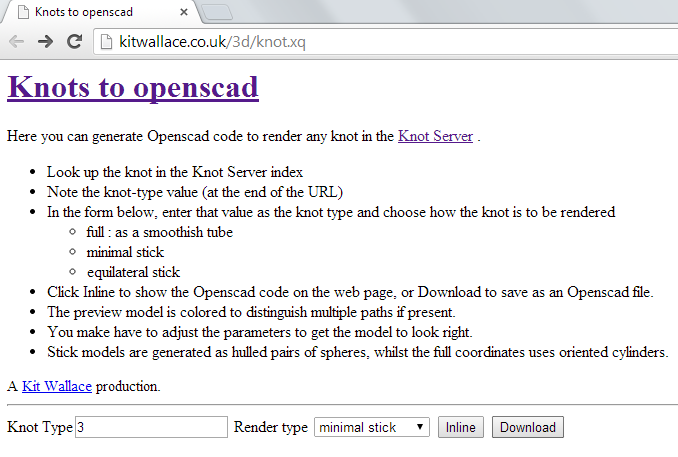 When the resulting file is opened in OpenSCAD, the knot will be very thin and not suitable for 3D printing. To thicken the knot, you can adjust the radius parameter. However, the thicker knot may overlap itself. 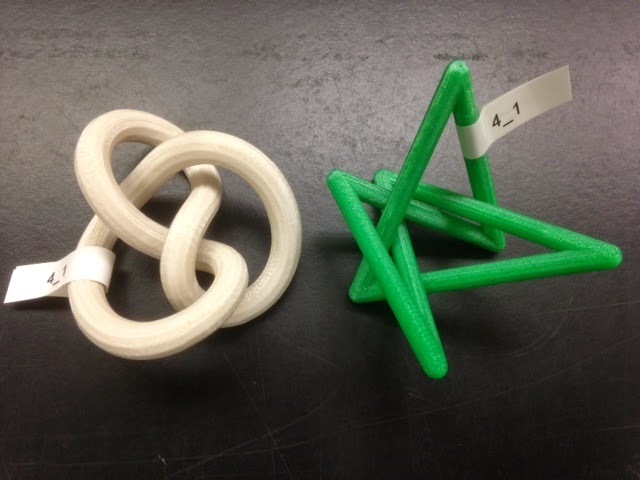 To change this we can manipulate the end points in order to open the knot up so that the sides no longer overlap. The code used for the model is as follows. Once you are happy with the knot conformation, press F_6 in OpenSCAD to render the model in full quality so it can be exported. The site has been improved recently. You now enter A-B notation directly. The full form uses interpolation to generate smooth knots. Known knots are selectable by name. I've added functional forms of those knots for which I have found such forms, such as the rolling trefoil and indeed this figure-of-eight knot. I'll add more as I find them. The smooth and function forms currently still need the development snapshot.